Chinese brand OPPO seems ready to fight for its market share in the West with a range of impressive new devices. Chief among them is the Find X, a top of the range smartphone with impressive features that looks like it could give the likes of Xiaomi and OnePlus a real run for their money, not to mention established market leaders Apple and Samsung. Let's take a look at what we know so far. The most recent information about OPPO's next top of the range comes directly from the company itself. OPPO is keen to point out how Find X will be able to revolutionize the smartphone market, bringing with it numerous new technologies developed by the company itself. OPPO presented its technology for a dual camera with 5x optical zoom at MWC 2017 in Barcelona. Inspired by the submarine periscope, the camera has a telescopic lens and uses a prism to direct light to the sensor inside the 90° angle housing. This would give the camera enough space to take advantage of the zoom without losing quality and still keep the smartphone thin: the module thickness is about 5.7mm and according to OPPO is even thinner than normal 2x optical zoom modules by 10 percent. Another of the technologies developed by OPPO concerns the fast recharging of smartphones and is called VOOC. During MWC 2016 the company presented its Super VOOC capable of fully recharging a 2500mAh battery in about 15 minutes. 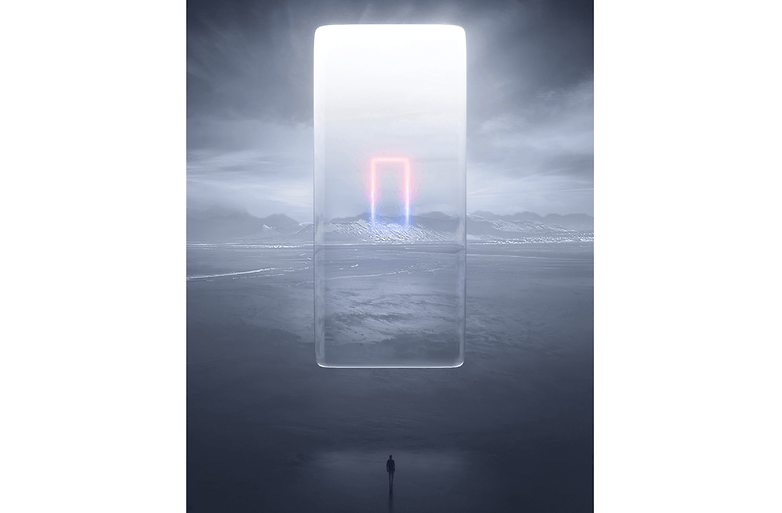 If OPPO Find X really were to use a 4000mAh battery it would be able to recharge from 0 to 100 in less than 30 minutes! The most recent technology introduced by OPPO dates back to January 2018 and concerns video calls via the 5G network using so-called 3D structured light. 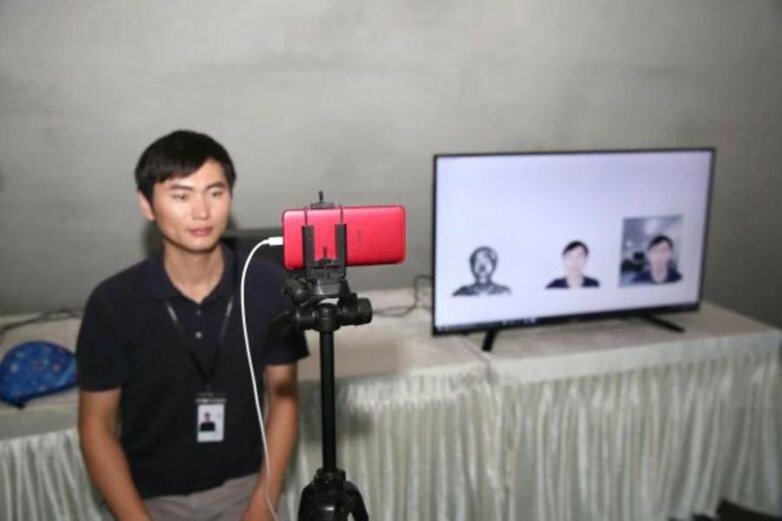 In short, the new technology developed in collaboration with Qualcomm is able to recreate a 3D model of the partner thanks to color and depth information from the camera of the smartphone and then transmit it on the 5G NR network. OPPO promises to use this technology in future applications such as secure payments, AR, gaming and much more. Will FaceID also be coming on the Find X? These technologies, if all implemented and working on the next top of the range OPPO, would make the smartphone one of the most advanced in the world. In anticipation of the official announcement, OPPO has reopened its website dedicated to the Find flagship range. Aside from aa teaser about the new incoming smartphone that doesn't provide much information except the name, you can also take a look at the old smartphones of the Find range such as Find 7 and 7a. 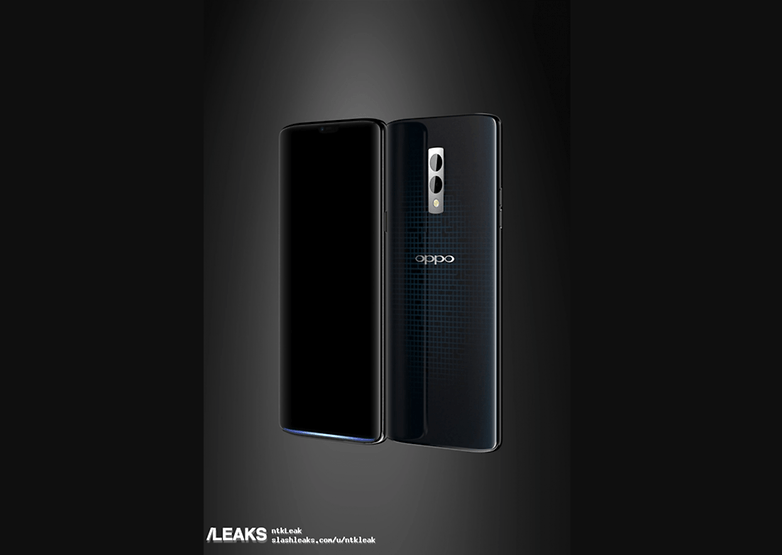 A render purporting to be of the OPPO Find X has appeared showing an interesting new design for the next Find flagship. The render shows a smartphone with a glass back panel and an interesting plot drawn. The smartphone is represented with a metal structure and the characteristic LED bar of the Find line on the bottom. A double camera is visible on the back. The two sensors would be included in a metal module similar to that of Find 5 and OnePlus 2. 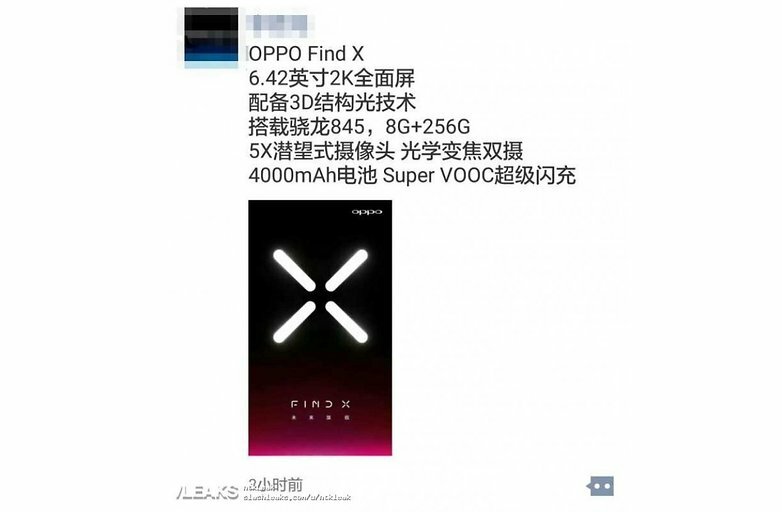 On the Chinese social Weibo, in the meantime, the complete specifications of the Find X have been leaked, revealing a very respectable technical data sheet. The screen should be a 6.42 inch QuadHD+ resolution with a very high screen surface ratio. 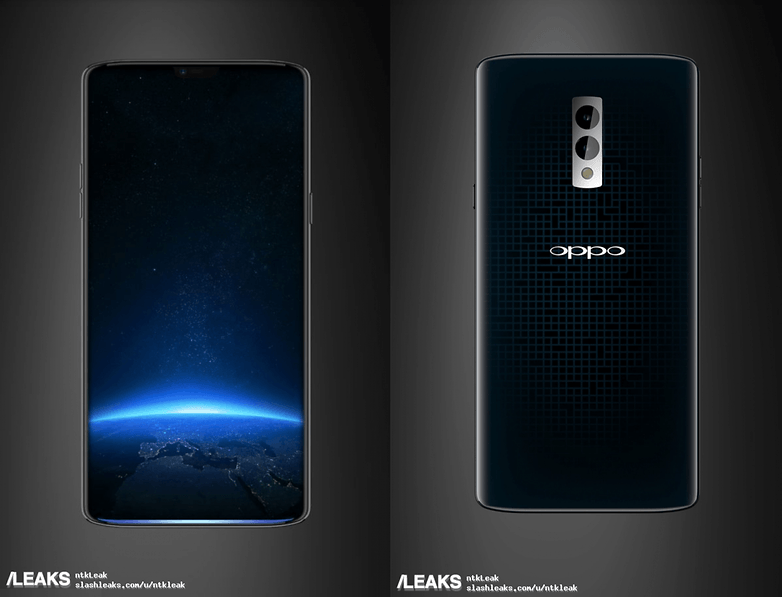 It's probable that the aspect ratio will be similar to that seen on the latest OPPO smartphones with the notch. OPPO Find X should use Qualcomm's latest top-of-the-range chip, the Snapdragon 845, accompanied by 8 GB of RAM and 256 GB of internal memory. It's finally official. OPPO will arrive definitively in Europe on June 19th during an official event to be held in Paris, France. 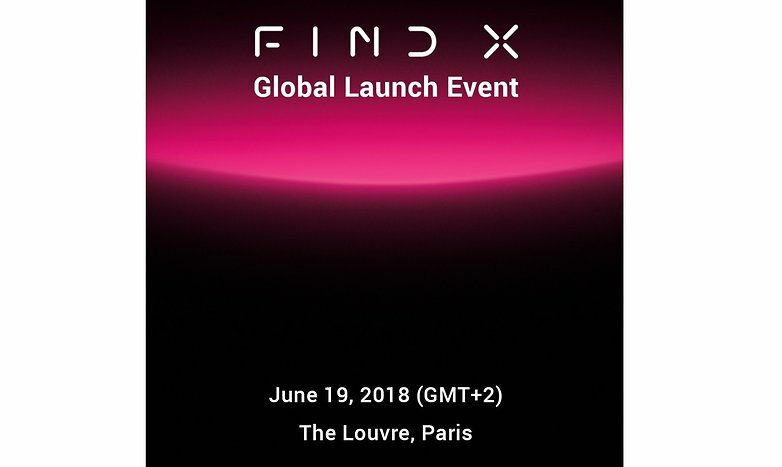 More precisely, the location chosen for the event is the famous Louvre Museum and, judging by the invitations sent to the international press, it will also be the presentation day of the OPPO Find X. Naturally, we will be present at the event to bring you all the news that will be announced! As of yet, we don't know if the Find X will also challenge the notoriously difficult North American market, particularly since the US government has been viewing Chinese manufacturers with some suspicion. But if OPPO's relatives OnePlus can find success, perhaps it will soon be OPPO's turn to chase the American dream. What do you think about the Find X? Will OPPO will be able to compete with the latest from Xiaomi?